NORTH NORWICH, NY - 2/5/02 - Veteran 358-Modified driver Mitch Gibbs and Gibbs Racing would like to proudly announce their marketing partnership with local convenience store giant Nice N Easy Grocery Shoppes for the 2002 race season at Utica-Rome Speedway and specials on the Super DIRT Series. Gibbs recently finalized negotiations with Nice N Easy Owner and President John MacDougall on January 23 at company headquarters in Canastota, New York. This will enable the popular Gibbs to compete weekly in the tough DIRT 358-Modified division at Utica-Rome and be a major threat for the coveted track title. "It is an honor to be carrying the Nice N Easy name at Utica-Rome," said Gibbs, who was the 1996 track champion. "We restarted Gibbs Racing last season and really worked hard make this happen as we were looking for a major sponsor for 2002. We feel Nice N Easy is a great fit for us and we are sure this will be a great marketing partnership for both parties." Other sponsors joining the 2002-campaign with Gibbs Racing and Nice N Easy include Cossitt Concrete located in Hamilton, Steel Sales, J & K Auto Parts, Skip's Trailer Sales, Newell Steering, Bob's Used Cars, and The Music Shop Pub. Nice N Easy Grocery Shoppes is a convenience store chain comprised of 81 stores throughout New York State. The company has been in business for 22 years with corporate headquarters located in Canastota. The stores are always clean with a friendly and helpful staff, and they have adopted the theme "Experience the Difference" as an invitation to customers to shop its stores. Customers can experience the difference in Nice N Easy's exceptional values, quality fresh foods and friendly service. "We are really blessed to have so many great sponsors," said an appreciative Gibbs. "Many of those have been with us for the past twenty years. They have been a huge part of our racing program." Mitch has 125 wins and eight track championships in his illustrious career. 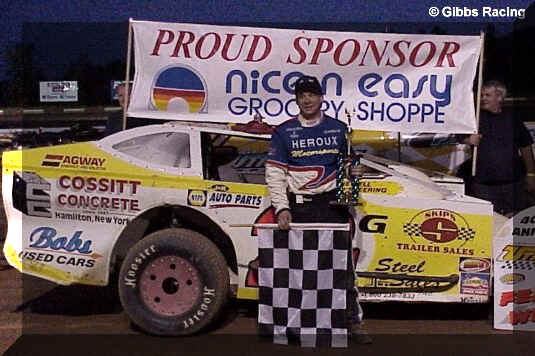 During 2001, he was the DIRT 358-Modified track champion with five wins at Afton Speedway. He visited victory lane three times at Five Mile Point Speedway and twice at Utica-Rome Speedway, one time of which he was driving a borrowed car. With the seasoned No. 2g crew which is made of Charlie Crandall, Scott Laughlin, Wade Camenga, Jim Raymond, Mark Godshalk, and Trevor Rodman the 2002 season should prove to be a solid one, especially with the new backing from Nice N Easy Grocery Shoppes. Gibbs Racing's first outing in 2002 will be at the Carquest Motorsports Expo at the New York State Fairgrounds in Syracuse on March 8-10, and the new Nice N Easy No. 2g is scheduled to be on display in the Utica-Rome Speedway booth. In addition to running the Nice N Easy No. 2g on Sundays at Utica-Rome and Super DIRT Series specials, Mitch will again be driving for the Chenango Tobacco Free Coalition No. 7 Wilson Motorsports team at Afton Speedway on Friday nights. Saturdays will find Mitch behind the wheel of the Gypsum Express sponsored No. 94 Heroux Motorsports car at Five Mile Point Speedway in Kirkwood. "We would like to thank our sponsors and our race fans for their continued support," said Gibbs. "They are the reason we are able to race year in and year out."